SUBHEAD: EPA's Emergency Radiation Limits are coverup for danger of Fukushima's continued pollution. 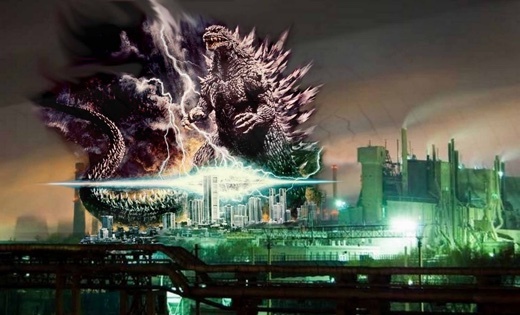 Image above: Illustration of Godzilla, the monster awoken from below the ocean by nuclear bombs. From (http://radioactivechat.blogspot.com/2012/01/fukushima-daiichi-running-without.html). The Environmental Protection Agency (EPA) is poised to issue guidelines that would set radiation limits for drinking water during the "intermediate period" after the releases from a radioactive emergency, such as an accident at a nuclear power plant, have been brought under control. The EPA has stressed that the proposal is aimed at guiding state and local leaders during a crisis and would not change existing federal radiation limits for the water we drink every day, which are much more stringent, and assume there may be decades of regular consumption. Critics of the new proposal say the emergency guidelines are a public relations ploy to play down the dangers of radiation and provide cover for an agency that fumbled during the Fukushima disaster in 2011. Now, in the twilight of the Obama administration, the EPA's "Protective Action Guidelines" for drinking water are once again drawing fire from nuclear watchdogs and public officials. "The message here is that the American public should learn to love radiation, and that much higher levels than what are set by the statutory limits are OK," said Jeff Ruch, executive director of Public Employees for Environmental Responsibility (PEER), a watchdog group that represents government employees. PEER says that internal documents released under the Freedom of Information Act show the EPA's radiation division hid proposed limits for dozens of radionuclides from the public -- and even from other divisions within the agency that were critical of the plan -- in order to "avoid confusion" until the final guidelines were released. "It's not like this has been done with a lot of openness," Ruch said. "We had to sue them to find out what levels they would allow." In 2011, the Fukushima Daiichi Nuclear Power Plant in Japan suffered a meltdown after a deadly earthquake and tsunami and released massive amounts of dangerous radioactive contaminants into the ocean and atmosphere. Ruch said the EPA was caught with its "pants down" as this radiation was detected in air, rainwater and even milk in the United States. The EPA had been working since the early 1990s to develop guidelines on how the government should respond to such a disaster, but specific limits for radiation in drinking water are only now being set. As Truthout reported at the time, the EPA told the public that radiation from the disaster would not reach the US at levels high enough to pose a public health concern, even as the agency's own data showed concentrations of radionuclides in rain water far exceeding federal drinking water standards. As Japan struggled with a major nuclear crisis and the media debated the relative danger of radioactive plumes blowing about the world's atmosphere, the EPA quietly stopped running extra tests for radiation less than two months after the disaster began. By then, samples of cow's milk, rain and drinking water from across the country tested positive for radiation from the Fukushima plant, and nuclear critics warned that it was difficult to tell whether there could be impacts on human health in the absence of enhanced radiation monitoring. The EPA's radiation division is now on the verge of approving a long-awaited update to its Protective Action Guidelines for responding to such a "large-scale emergency." Ruch said employees from other divisions of the EPA were cut out of the decision-making process, and internal EPA documents indicate that the concentration limits were set higher than those detected during Fukushima to cover for the EPA's embarrassing performance. Ruch points to notes from a 2014 briefing at the EPA's radiation division, which state that the agency "experienced major difficulty conveying its message to the public" that concentrations of radioactive material in rain water, although higher than federal Maximum Containment Levels (MCLs), "were not of immediate concern to public health" during the Fukushima crisis. The EPA's new proposed guidelines are ostensibly meant to help public officials decide when to take protective actions to reduce exposure to radiation, such as asking the public to switch from tap water to bottled water. Most of the manual has already been finalized, except for the section on drinking water, which has been mired in controversy since the Bush administration. In June, the EPA put the proposal up for public comment, but only made limits for four types of radionuclides publicly available. Critics say the agency still received 60,000 comments opposing the guidelines, including statements from 65 environmental groups. PEER sued the agency under the Freedom of Information Act in October, and the EPA released the proposed limits for dozens of other radionuclides just days before the Christmas holiday. "It's really hard to believe," Hirsch said. Underlying the debate are MCLs for radioactive material in drinking water set by the Safe Drinking Water Act of 1974. Hirsch said that the nuclear industry has tried to "get out from under" these limits for years, but federal law prohibits them from being lowered. So, the industry and its allies at the EPA focused on the Protective Action Guidelines instead. The MCLs are based on the idea that adults should not be exposed to more than 4 millirem (mrem) of radiation in drinking water each year for a 70-year period, for a total of 280 mrem in an average lifetime. Since the "intermediate phase" following a nuclear emergency is expected to be temporary, the emergency radionuclide limits are capped at amounts that would expose adults to a maximum 500 mrem dose of radiation over the course of a year. Hirsch said that such as dose of radiation is equivalent to receiving a chest x-ray about five days a week for a year. The EPA arrived at these figures by "playing" with the numbers used to calculate radiation absorbed by human organs, which in turn increased the amount of certain radionuclides that can be present in drinking water by hundreds, thousands and even tens of thousands of times. Hirsch said guidelines reflect the nuclear industry's longstanding argument that MCLs are far too low, and the public should accept higher doses of radiation as permissible in an emergency. The EPA claims there have been "advancements in scientific understanding of radiation dose and risk" since it began drawing up the Protective Action Guidelines back in 1992, and its emergency dose guidelines are based on the "latest science." The guidelines are also designed to provide flexibility for decision-makers responding to a crisis. "The science has actually worked in the opposite direction over the years," Hirsch said. "Science has concluded that radiation is much more dangerous than what was assumed in the '70s." The guidelines are based on expected exposure over the course of one year, but both Ruch and Hirsch point out that radiation from nuclear calamity could persist for far longer -- just look at the fallout from Fukushima, which Japan has struggled with for years. Radiation from the disaster is still being detected in fish on North America's western coast. They argue that the public needs better protections in the event of an emergency, and the nuclear industry should not be let off the hook based on inflated safety limits. "The whole thing appears to be [an attempt to] achieve a post-incident reaction of 'don't worry be happy,'" Ruch said. • Mike Ludwig is an investigative reporter at Truthout and a contributor to the Truthout anthology, Who Do You Serve, Who Do You Protect? Follow him on Twitter: @ludwig_mike. TruthOut: Radiation Detected in Milk, Air and Water - Is America Safe?